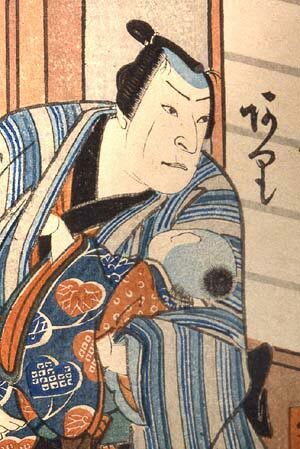 When evaluating the condition of an old Japanese print, do not let concerns about faded colors, stains, worm holes, pin holes, foxing, toning, folds, trimming, rubbing, backing, and the host of other afflictions that beset paper and natural pigments get in the way of the crucial question, which is: "How good and early is the impression?" You may remember your mother teaching you about the importance of first impressions. Well, she was right ... at least in terms of classic ukiyo-e prints. It is almost always true that early in the run of an edition, impressions look sharp, crisp, clear, well-registered, and presumably closer to the artist's original intention. Hence the well-founded thinking that leads serious collectors to seek upgrades of images already in their possession, a quest that could be termed "Early Impressionism." 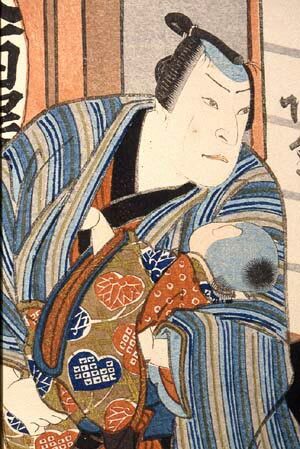 "Early" becomes synonymous with "good" not only because the thin lines carved in relief on woodblocks tend to break apart after repeated rubbings — resulting eventually in blank faces, literally, on geisha and unimposing, fade-away landscapes — but also because of the nature of ukiyo-e production in Edo-Period Japan. Simply put, once the integrity of the finer lines started to deteriorate, something that could happen after several hundred rubbings, publishers were prone to cheapen the rest of the print's look, as well: the pigments, the paper, perhaps the special effects like metallics and lacquer, the number of blocks used, the time taken to properly line up the blocks, and so on. The number of technical changes made between early and later impressions was particularly dramatic in kabuki-crazed Osaka, where publishers formally offered "deluxe" and "standard" editions of many actor prints. The latter clearly betrayed numerous cost-cutting techniques of the kind mentioned above. However, since the overall print market in Osaka was quite small, and the number of spendthrift buyers only a fraction of that, the shift from deluxe to standard tended to take place quite early in each print's run — perhaps after only a few hundred. The result is that even a standard "pull" retains a well-delineated, well-executed look and rare is the evidence of material or human fatigue. In effect, a down-market "late" Osaka impression looks shabby only in comparison with its deluxe predecessor, and the "average" Osaka piece offers printing far superior to that of its (distant) cousin in Edo where — thanks to a nationwide market for its wares — an edition could easily number 5,000 pieces or more. Figs. 1 and 2, the right side of a diptych by the Osaka artist Sadanobu I (1809 -1879) show kabuki actor Gadô Ichizô I in an 1850 performance. Fig. 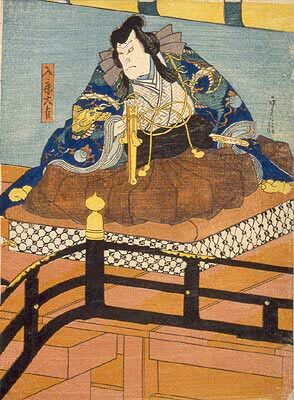 1 is the earlier impression, and note the use of metallic pigments in the kimono, the sword, the seat cushion and the balustrade. Less easy to spot is the blind embossing on the collar and sleeve of the kimono, as well as on the rolled up curtain-screen. in other genres, look closely at the thinnest lines on the paper, wherever they may be. The quality of the nose, usually a very delicate line that stands apart for easy study, is a more foolproof indicator of a block's history than, say, the Western print numbering system, which after all is based solely on a hasty pencil stroke and blind trust in the artist's honesty. In general, a smooth, even-density unbroken nose line means you have an early impression, while the choppier and less fine-edged it is the later your print. However, always scan a print with sensitivity. A printer could have mistakenly rubbed too weakly over the nose area at the beginning of a run, while, conversely, a heavy inking job late in the day, as in Fig. 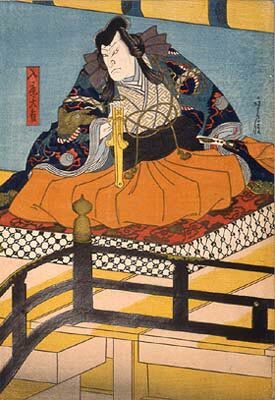 3, (the actor Jitsukawa Ensaburo from 1849, also by Sadanobu) can look deceptively strong. Yes, Fig. 4 is the earlier rubbing — note the child's kimono and the extra metallic line on papa's — proving that first impressions can be misleading. This article originally appeared in Daruma, no. 14, Summer 1997. Copyrighted © text and pictures reprinted with permission.